They’ve pulled it off! John and Babe Shepherd, owners of Red Mill Burgers, have scored a lease on the Totem House. This week the windows at 3058 N.W. 54th Street are papered over. Dumpsters have arrived for construction detritus. And now comes the fun part: turning the landmark fish ‘n’ chips joint across from the Ballard Locks into Red Mill Totem House. Built in the 1930s as a setting for selling Native American artifacts, closed during World War II, reopened as a restaurant in 1945 and abruptly shuttered New Year’s Eve 2010, the newly refurbished Totem House is expected to reopen in September. And yes, you’ll still be able to get a cup of chowder alongside your fish ‘n’ chips — and your Red Mill burgers. Not that clamoring crowds ever stopped Babe, who can regularly be found flipping burgers at their Phinney Ridge store. “Saturdays are insanity,” she insists, “and I’m there with a grin on my face and a line out the door.” Despite the proximity of their other stores, “I think we’re going to be busy from the get-go,” predicts the woman whose famous onion rings will star on the Totem House menu. 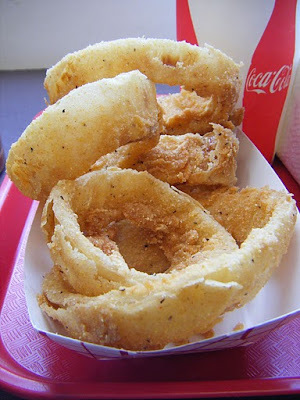 The quality of those crisp rings bodes well for the fried cod she expects to sell come September. It’s been 17 years since the debut of Red Mill Burgers on Phinney Ridge, 12 years since the Shepherds opened their second shop at Interbay and five years since they first cast their professional eye on the Totem House. “This was the only location we really wanted — if we were going to open another one,” said Babe. They made a bid for the property in 2006, but it sold instead to a large investment company that owns the adjacent apartment complex, Lock Vista. “We’re third-generation Seattleites,” Babe said, explaining their ties to the spot. “I love my city. And the Totem House is quintessential Seattle, it’s quintessential Northwest.” Ours is also a city stung by the bulldozing of landmark restaurants, say the Shepherds (see: Twin Teepees). Which is another reason this is a site worth saving — for now, at least. “We’ve got a 10-year lease, and we may have to walk away from it in 10 years,” John said. Meanwhile, they intend to see to it that history prevails, and since getting the keys to the Totem House, they’ve been uncovering that history piece by piece. “We’ve powered through the ceilings and found old hand-hewed beams from back when this was an Indian log house,” John said. “It’s virgin wood. Hand-hewn cedar flattened out with axes and rounded. They’re run through the whole building — they’ll be neat to expose.” While the interior will be made over with a floor plan that echoes the other Red Mills, the feel will be distinctly Northwest. “The [existing] dining room is basically a stand-around,” said Babe. “We’ll push it back to get some seating, maybe five or six four-tops,” plus some cedar countertops with stools. Plans call for adding a roof over the patio, with 30 outdoor seats. “I love the building,” said Babe. She’s clearly not alone. The totems are old and weathered and in need of loving care. There are two 5-foot totems found in storage that eventually will hang inside over a cedar table. Four original totems once stood sentry at the house’s corners, but today that number is only one — a rotten one, at that. And John knows he and his sister will be calling a professional to remove the moss and the birds’ nests on the hand-carved pole out front of the Totem House, welcoming us to this landmark’s latest incarnation. According to Robin Wright, curator of Native American art at the Burke Museum, the cap on the remaining corner post (at right) is that of a human figure wearing a traditional woven spruce root or cedar bark hat. This central totem (and its brethren) is the work of Jimmy John, a Nuu-chah-nulth carver. Carved in 1938, the artwork depicts a raven at the top, with an unknown type of bird beneath it, nestling a second raven between its wings. Below it is a wolf with a long snout, and between the wolf’s feet is a human figure, positioned upside down. At the bottom is a killer whale whose dorsal is depicted up the side of the pole.